Soldiers’ Monument, in downtown Portland’s Lownsdale Square, is a monument to Oregonians killed in the Spanish-American War. 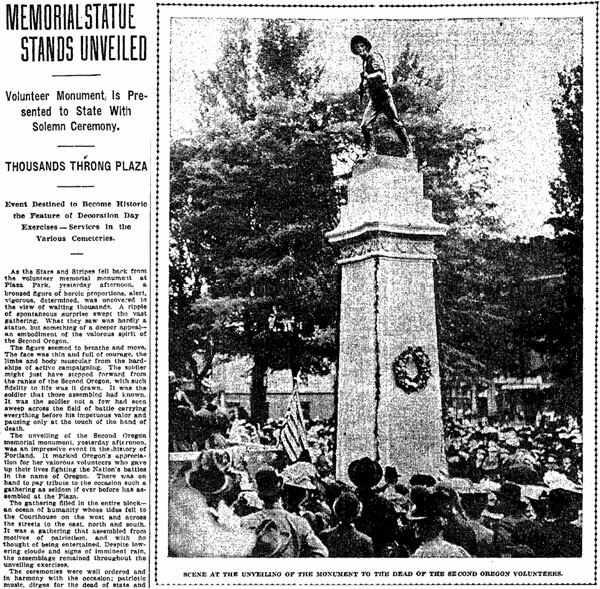 It was unveiled with great ceremony on May 30, 1906 (Morning Oregonian, 30-May-1906). This is the day the Nation pays respects to its soldier dead. Here in Portland Decoration day has always been elaborately observed, but this year it will be of all the more interest and importance because of the impressive ceremonies which will be performed this afternoon at Lownsdale square, when the monument to the memory of the Oregon boys who fell in the Spanish American War will be unveiled and formally presented to the city. The tall granite obelisk is topped with a bronze replica of an infantryman of the Second Oregon U.S. Volunteer Infantry, part of the first large American fighting force ever sent overseas. At the base of this monument are two small cannons from Fort Sumter (misspelled on the plaque) brought here by Colonel Henry E. Dosch. Because the cannons were used by both Union and Confederate troops, it was Dosch’s idea to face one north and one south. For more on the cannons, including photos, and the misspelling, check out the cyclotram post: Ft. Sumter Cannons, Lownsdale Square.